The advantages of the Egyptian Textile Industry stands on the in-house availability of the raw material of Egyptian Cotton, portions of which Turkey and India imports from Egypt in order to produce high quality products made of 100% Egyptian Cotton for the worldwide demand. Fabric production includes fine Egyptian cotton fabrics, shirting, fabrics for trousers/shorts, worsted wool fabrics, denim, fleece, jersey, flat/woolen knits, technical fabrics, and more. Apparel production includes active sportswear, outerwear, underwear, suits, socks, infant wear etc. Production of made-ups includes a wide variety of bed, bath, and table linens, kitchen accessories etc. The size of Egypt’s population is one of its other strengths. Its labour force, close to 18 Million, is an excellent source of productive and inexpensive labour combining semi-skilled, skilled and highly qualified employees. The labour force has grown at an average rate of 2.70% a year. Low wages have encouraged the use of labour-intensive technologies. The weight of the work force of the Egyptian textile and apparel industries in Egypt’s total employment does not exceed 7.7% which is the lowest compared to Pan-Euro and Pan-Med countries. Meanwhile, Egypt has become worldwide labour cost competitive, expressing the lowest textile total cost of labour, which, is considered a vital opportunity to grasp within the Pan-Euro-Mediterranean labour intensive apparel manufacturing. Egypt’s annual inflation is expected to reach 13% in 2018, while the devaluation of the local currency has increased the competitiveness of the Egyptian Textile Industry, hence becoming by far much cheaper of any textile and apparel manufacturing country in the region. Egypt’s industry has consistently remained flexible in terms of production quantity and lead time and thus presents the possibility of producing quantities as low as a few hundred pieces. A large base of European and American customers are already served from Egypt, representing almost 90% of Egypt’s Apparel exports. 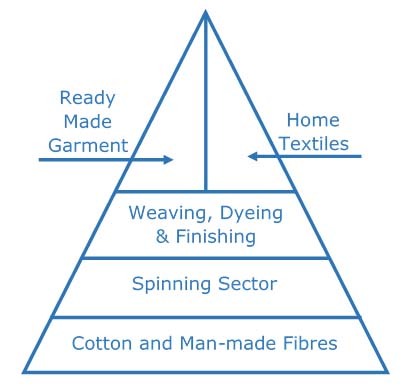 The textile and apparel industry is an important one to Egypt, contributing 30% of industrial production and 10% of total exports. The EU partnership agreement with Egypt allows Egypt to export textile and apparel products to the EU countries, without custom tariffs (Free Trade).